"Our emphasis has always been on jewellery but we did carry other specialities as well. We brought a substantial amount of stock with us from Botswana some of which was already off trend in terms of the English market but a lot of which definitely wasn’t and had the advantage of being "fresh to the market”. Sue and Alan are very well known on the UK fairs circuit travelling across the UK from Devon to Dundee to meet new clients in a different venue, sometimes 24 fairs in 12 months – hardworking troubadours of the trade putting on a show for a new audience in each location and making sure their extensive stock sparkles afresh each time. They have been trading in the UK since 2006 relocating from Botswana where their business began which is where we pick up their story. Scarab Antiques, Sue & Alan Poultney - The Happy Couple! 1 ANF: When did you two meet – we understand it was in Botswana? How did you decide upon Scarab Antiques as your name? AP: We met in Botswana in 1997 to be precise. 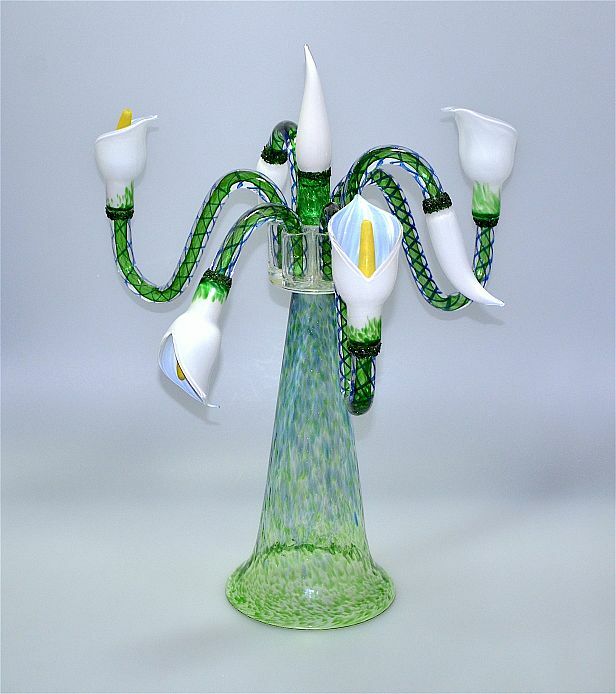 When we decided to come to the UK which was coming home for Sue, we wanted to call our business Dungbeetle Antiques but friends advised against it so we chose Scarab Antiques as our name instead although we had already registered the email address of dungbeetleantique@btinternet.com. The reason that we wanted to call ourselves Dungbeetle Antiques is because the dungbeetle is the hardest working beetle in the African bush – it goes out gathering up dung which it rolls up into a big ball, and then pushes backwards to its burrow and then it’s larvae feed off it which is pretty much what we do – off all over the place gathering up wonderful things that provide us with income and sometimes yes this business is an uphill struggle to find those wonderful things that hopefully people will like and are willing to buy to enable us to go running off again to find more things! Of course we only gather good dung! However people always remember our email address which is a source of amusement and we are often greeted with “Ah yes you are the dungbeetles”! Alan Poultney Tsavorite & diamond platinum ring. 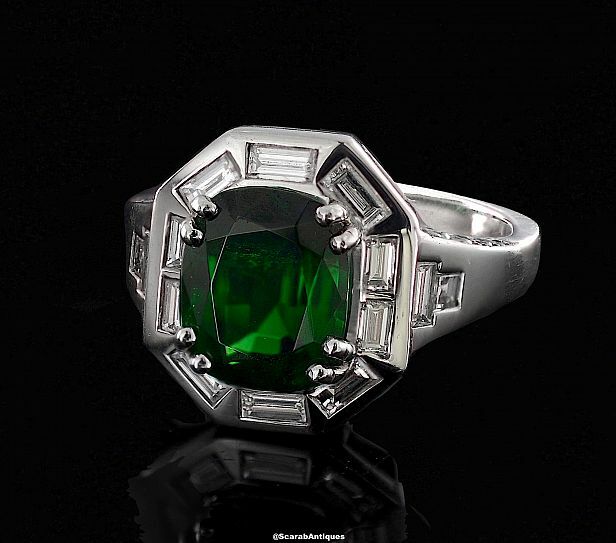 This fabulous Tsavorite - (green garnet) ring has been handmade in platinum to Alan's design using stones selected by him. 2 ANF: Alan, you started your career as a diamond cutter? Can you tell us about your early career? SP: Alan actually stated his career as a stone cutter which although it included diamond cutting has always been predominantly and is now only coloured stone cutting. As a youngster his job was to clean and polish the silver and jewellery in his father’s valuation business in Rhodesia. When he left Rhodesia he spent time in the Far East dealing in coloured gemstones and learning about heat treatment. On his return to join his family, who had moved to South Africa, he learnt to cut gemstones (his father gave him one lesson and then told him to get on with it!) and then joined his father in their business travelling throughout Africa buying rough diamonds and gemstones and selling the polished stones, Alan having cut the coloured gemstones. He and his father set up the first diamond grading centre in South Africa that graded to the GIA standard. 3 ANF: Sue, you were a corporate lawyer in your former life – what took you to Botswana and how did you make the big shift to becoming an antiques dealer? AP: Yes Sue was a lawyer, initially a divorce lawyer, in the UK and then once in Botswana she switched to corporate law and then specialised in labour law finally setting up her own consultancy business specialising in employment and labour law. Sue always says she went to Botswana as accompanying baggage to her first husband who took up an educational post, but she went secure in the knowledge that she would be able to continue her legal career once there. We began collecting antiques together in Botswana and in the end our small cottage set on the edge of a lake in the bush on the outskirts of Gaborone was full to overflowing and like you do, we just thought – “let’s open a shop”. SP: Alan was busy designing jewellery for clients in Botswana which was handmade for him by his brother Randal and so this shop was almost an extension of that. We had spare space in my offices so we opened the shop which at that time was the only antiques shop in Botswana. 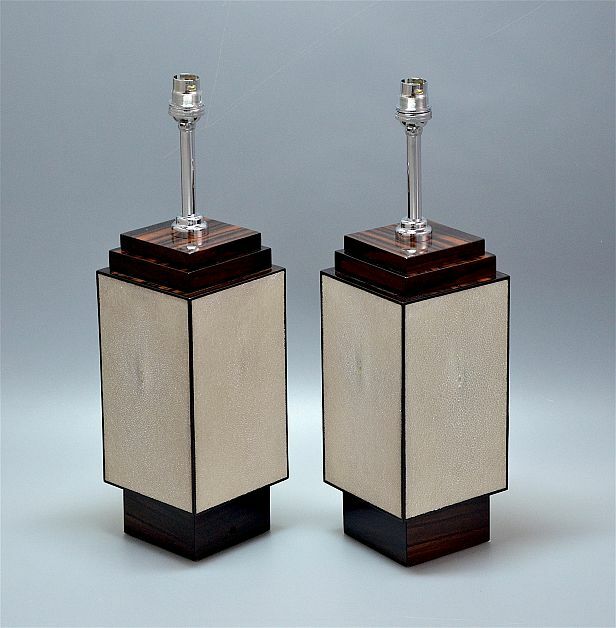 We sold across the board – furniture, ceramics, lighting, decorative objects all mainly Art Deco but the emphasis always was on jewellery: silver antique & costume plus Alan’s bespoke custommade jewellery. I continued with my consultancy business so Alan pretty much ran the shop during the week. Weekends were always taken up with travelling to South Africa on buying trips with one weekend a month devoted to a social event in the shop with food and drinks to showcase the new purchases and to keep us in the mind’s eye. 4 ANF: When did you move to the UK and were you already trading as dealers in Africa or was this part of the reason to move? AP: We came to the UK in 2006 – Sue basically came home and almost immediately set up Scarab Antiques and started doing the fair circuit. 5 ANF: When you started trading, was it specifically in jewellery both contemporary and antiques or did you deal in other specialties? You are known for Decorative Arts, Art Deco and jewellery both bespoke and antique – tell us how your style has evolved over time. SP: Our emphasis has always been on jewellery but we did carry other specialities as well. We brought a substantial amount of stock with us from Botswana some of which was already off trend in terms of the English market but a lot of which definitely wasn’t and had the advantage of being “fresh to the market”. Gradually over time we have stopped selling ceramics and silver objects and we no longer deal in anything that is pre 1900. We do more jewellery commission work than we used to and now make a lot of jewellery for stock handmade by our wonderful team to Alan’s design, using gemstones cut by him. 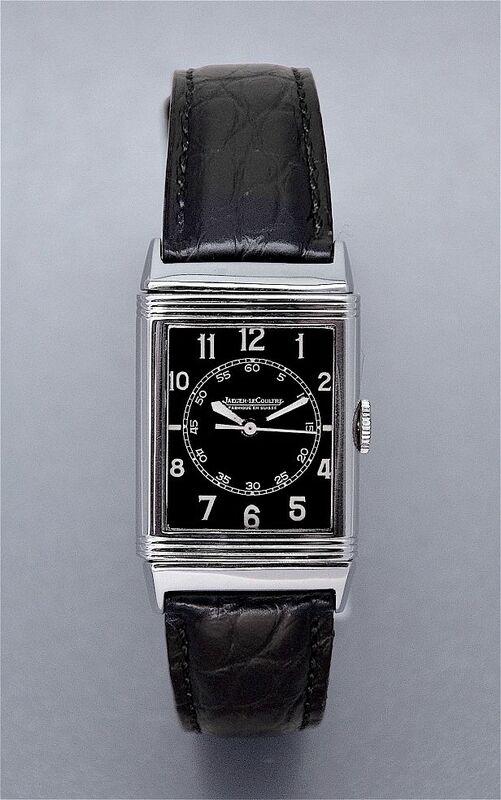 Vintage watches have become a large part of what we do as this has always been a passion for Alan. In terms of other areas we are now predominantly Art Deco or modern and in particular carry contemporary glass by Michael Hunter, enamel & silver by Jean Wilkinson, contemporary silver jewellery by Simon Mower and of course TCH Lush Decadencejewellery. We try to create a small lifestyle set on our stand with lighting mirrors and furniture but ultimately we only buy what we like - we cannot sell things for which we have no enthusiasm. I suppose we are becoming a mobile gallery. 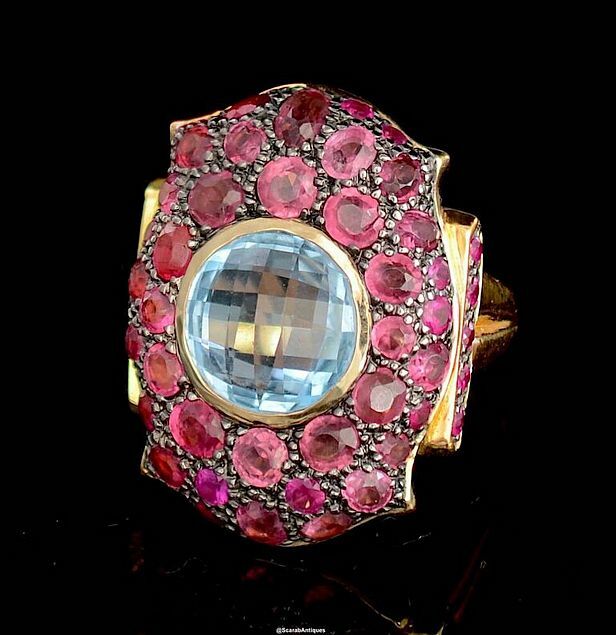 This lovely plaque ring was designed by Toma Clark Haines for the TCH COLLECTION and is part of La Vie en Rose collection. 6 ANF: You have recently become sole UK agents for a jewellery line designed by The Antiques Diva, under the brand name TCH Lush Decadence – how has your audience responded to this new range? SP: Extremely well! The pieces are bold and decadent, some are not for the faint hearted, but everyone who tries on the pieces including those who are initially reluctant to do so (“they are too big for me” / “it’s not my kind of thing”) are all won round by how well the pieces sit and how good they feel & look on their hand or in their ears. The jewellery appeals to all ages although it is true that our more mature ladies seem to have the confidence and attitude to wear them. 7 ANF: You are very well known faces on the UK antiques fairs circuit – tell us how you manage to run a business and yet keep up the pace with around 24 events a year? SP: Sometimes it feels like we are not keeping up! A run of 4 fairs back to back can be a little exhausting particularly as we travel considerable distances to do the fairs but it is like everything – it is what we do and therefore we get on with it and count ourselves lucky that we are able to do something that we love. These fabulous chairs were designed by Philippe Starck for Kartell and are know as "Eros" chairs. 8 ANF: Antiques for Everyone, (AfE) now Art & Antiques for Everyone, is an institution in the antiques trade – now more than 30 years established. Your stand in Section 1 always makes a big splash at this favoured event, at the NEC, (National Exhibition Centre) in Birmingham, for collectors and trade alike. Tell us when you started exhibiting at this show and about some of your highlights over the years. What changes have you noticed in the audience in that time? SP: We first stood at the AfE in November 2006. It was our 4th fair since coming to the UK, our first one being in a small village hall in Kent! Alan was insistent that we should do it and I was more reluctant as I felt we were still too “green” on the fairs circuit. Alan won and so we unpacked all our best pieces and off we went! AP: It was a baptism by fire but extremely successful and we have done every single AfE since then. 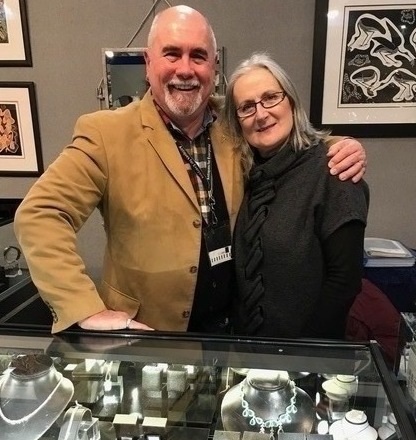 There have been many highlights both in terms of selling and buying and the people that we have met but I suppose our most memorable fair was the one when Sue found 3 sapphires that I recut into fabulous stones and made into jewellery. The audience has become much more discerning and careful in how it spends, demanding greater product knowledge and keener prices. There seems to be far less impulse buying which is not surprising in terms of the events of the last 10 years. 9 ANF: What do you think are the biggest changes to affect the antiques fairs industry in the past 20 years and how do you see the industry evolving. How much do you think the digital age has enhanced or diminished the ecosystem of the fairs and the shops? Do you have any plans to have a presence in a shop or centre? AP: The digital age has changed the industry considerably. A click of a button provides a huge array of goods from which to choose as well as a huge array of prices without leaving the comfort of your home. The auction house is no longer the sole domain of the trade and they have in our view become the retail outlet: television has shown the public that they can buy and sell at auction with confidence and has also encouraged them to seek bigger discounts from the dealers. The difficulty of getting onto the housing market is producing a generation that is seeking experiences rather than collecting things or decorating their homes. Those who are getting onto the housing ladder are doing so later on or with the help of the bank of Mum & Dad and this is having a huge effect on many of the fairs. More dealers are retiring and not being replaced with younger dealers. We are seeing less and less new (and younger) faces visiting the provincial fairs – London is a different market. We have tossed the idea of a shop around for the last 5 years but finding the right location for our business has proved very difficult. The decline of the high street means you have to find a very good go to destination with other like-minded individual/bespoke shops with a consistent footfall and that is not easy. We were in centres in the early years but have no current plans to revisit that – our schedule makes keeping them stocked with fresh goods almost impossible. Online sales has to be an area of concentration in addition to getting out there and networking and meeting people for which I think there is no substitution. 10 ANF: Bespoke and unique contemporary pieces are now accepted facets of the antiques industry which has conjoined with the design industry to keep pace with a new millennial audience – discuss! AP: Absolutely! We think that the changes that we have made in the items that we offer reflects the trend towards unique and contemporary pieces. 6 years ago a dealer told us that as we did not sell antiques we should find venues other than the fairs at which to sell our goods – no one says that to us anymore and indeed that same dealer 4 years later told us that we have to change or become dinosaurs!! 11 ANF: If it is possible that you ever get a chance to relax and if so, how do you unwind! AP: We are our business and almost everything that we do is business related. We are very privileged to do what we do and we get immense satisfaction from it. I would hate to spend my day wishing the hours away until 5pm. Featured content available from: Antiques News | For more information, please visit their website.